Hundreds of students, faculty and other members of the university community gathered on campus with the family of Jessica A. Moore, 19, who was shot and killed at a Sept. 25 house party in nearby East Orange. Prayers also were offered for students Nakeisha Vanterpool and Nicosia Henry, who were injured in the shooting and have since returned to campus. A slideshow ran during the service, projecting candid photographs of Moore, a sophomore from Disputanta, Va., and condolences from her friends and family. Gabriel Esteban, interim president of the Catholic school, assured the audience that Moore’s presence was with them at the service. Coming together as a community, Esteban stressed, was the best way to face such tragedy. Monsignor C. Anthony Ziccardi, vice president of mission and ministry at Seton Hall, encouraged the community to not lose faith, even after the senseless act of violence. 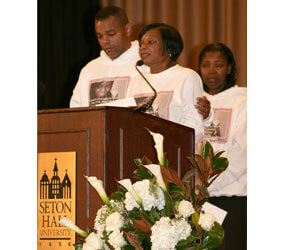 Olanda Tolliver, Jessica’s stepfather, thanked the Seton Hall community for their outpouring of love and support. He believed his daughter touched the lives of all she came in contact with and lauded her sense of spirituality. Her mother, Phyllis Moore-Tolliver, also offered her gratitude and encouraged everyone to strive for peace in the community. “Don’t let Jessica’s blood be spilled in vain. We must commit (ourselves) to end this violence,” she said. The two men arrested in connection with the shooting, Nicholas Welch, 25, and Marcus Bascus, 19, face murder, conspiracy, attempted murder and weapons charges.